Next week several SeRMN members will present our research work at the SMASH NMR Conference 2013 that will take place in Santiago de Compostela (Spain) from 22nd to 25th September. Find below a summary of our contributions. Míriam Pérez-Trujillo presents an Oral Communication and a Poster entitled “Differentiation of enantiomers in complex systems by NMR spectroscopy and chiral solvating agents: applications and methodology”. The differentiation of enantiomers in complex samples, like mixtures of compounds coming from body fluids, plants extracts, crude of reactions, etc. will be addressed. Related applications, as chiral metabonomics, and new approaches from the point of view of methodology will be introduced. Josep Saurí presents a Poster entitled “HSQMBC-TOCSY Experiment: A complementary tool for structure elucidation“. Several versions of a HSQMBC-TOCSY experiment for the success application on structural elucidation of small molecules in solution are presented. We evaluate the possibility to obtain TOCSY information for a non-protonated carbon and we also extend this feature to other heteronuclei, such as 19F or 77Se. We compare experimental data obtained from the conventional HMBC and HSQC-TOCSY experiments with respect to this complementary HSQMBC-TOCSY experiment. Additionally, 1H-selective versions will be also proposed for the accurate measurement of the magnitude of heteronuclear coupling constants, with special emphasis on the determination of the positive/negative sign of these couplings on non-protonated centers. We also evaluate the implementation of multiplicity-edited information, where CH/CH3 cross peaks can be clearly distinguished from CH2/C correlations thanks to their opposite up/down relative phase. 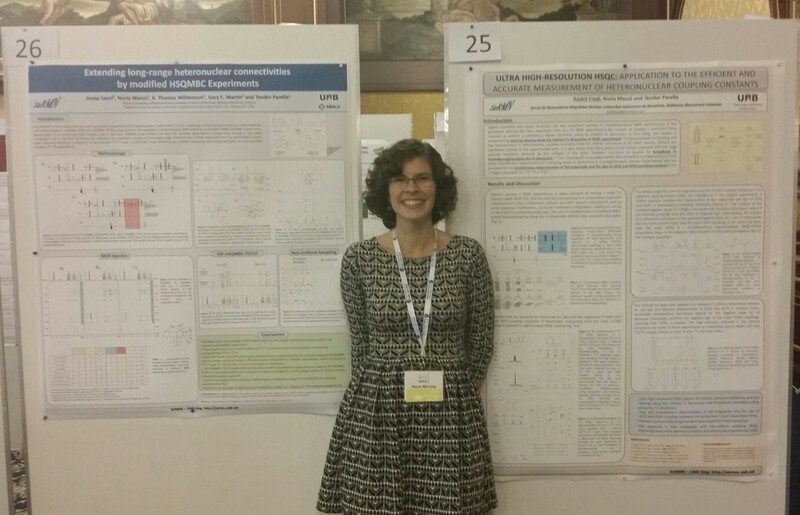 Laura Castañar presents a Poster entitled “Simultaneous milti-slice excitation in spatial encoded NMR experiments”. 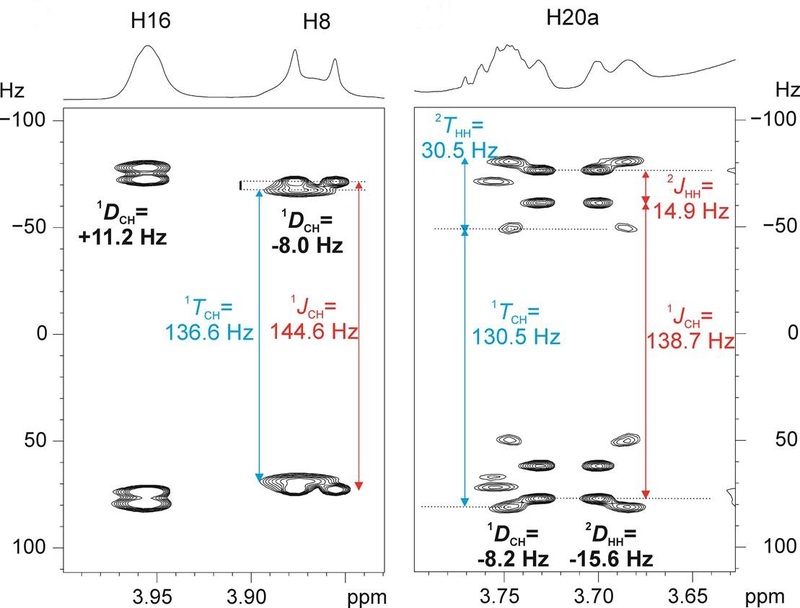 In this work a novel strategy to enhance the experimental sensitivity in spatially encoded NMR experiments is presented. We explore the sensitivity benefits of applying a multiple-frequency modulated pulse to excite simultaneously different slices in a single NMR experiment. Our proposal is based on the careful setting of multiple offsets to avoid the excitation of mutually J-coupled protons into the same slice which would produce distorted multiplets due to JHH evolution. The experimental set-up protocol to fulfill the sampled frequency requirement is simple and the results can be inmediately adapted to a wide range of applications, for instance, to obtain broadband homodecoupled 1H-MNR spectra. Albert Gargallo presents a Poster entitled “Metabolomic responses of Quercus ilex seedlings to wounding simulating herbivory“. Plants defense themselves against herbivore attack at several levels, being one of them the synthesis of inducible chemical defenses. The study of plant metabolic changes and processes related with herbivore attack has been mostly limited to the identification of single compounds or families of metabolites. We think that an ecometabonomic approach would provide a wider view of the phenomena, since that approach considers the metabolome of the plant, i.e. the total number of metabolites, and their shifts in response to an environmental change or, as in our case, in response to a plant-herbivore interaction. We have studied the metabolic changes of plant leaves after a wounding treatment simulating herbivore attack in the Mediterranean sclerophyllous tree Quercus ilex by a NMR-based metabolomic study. There is no much reported work regarding the response to wounding in trees by metabolomics. We aimed to discern whether mechanical wound injury in leaves changes its metabolome; for that we have chosen the widespread Mediterranean tree, Quercus ilex L. (holm oak), one of the most abundant species in Mediterranean forests. © 2013 – 2019, Laura. All rights reserved by the author(s) and Universitat Autonoma de Barcelona except for texts and images already copyrighted by third parties (e.g. journal publishers) and used here under the fair use provision.